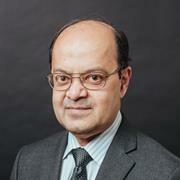 Saroj Biswas is the Associate Dean for Graduate Studies and Research and Professor of Electrical and Computer Engineering specializing in control and optimization of dynamic systems, electrical machines and power systems, multiagent systems, and distributed parameter systems. His current research focuses on security of cyber-physical systems based on multiagent framework with applications to the power grid, and the development of an intelligent virtual laboratory for electrical machines. He has also developed a control theoretic framework for regulation of magnetic signatures. Dr. Biswas is the author or co-author of over 100 research articles in refereed journals or conferences, and has been involved with $1.5M funded research from various industries and federal sources including NSF and ONR. He is an associate editor of Dynamics of Continuous, Discrete and Impulsive Systems, Series B, and is a member of IEEE, ASEE, and Sigma Xi. McJunkin, T.R., Rieger, C.G., Rege, A., Biswas, S.K., Haney, M., Santora, M.J., Johnson, B.K., Boring, R.L., Naidu, D.S., & Gardner, J.F. (2016). Multidisciplinary game-based approach for generating student enthusiasm for addressing critical infrastructure challenges. ASEE Annual Conference and Exposition, Conference Proceedings, 2016-June.